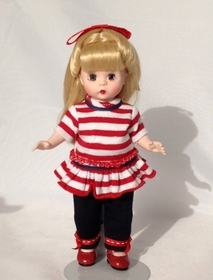 Blonde, blue-eyed, articulated, Wendy is dressed in navy ribbed knit pants trimmed at the cuff with red, white top-stitched trim adorned with tiny red bows on the side and paired with a red and white knit top. White anklets, red patent Mary Janes and a red hair bow complete her 'welcoming' look. Never displayed.